Mix one serving in 6-10 oz. of cold water in a shaker or glass as a meal replacement or as a keto-friendly snack. Try mixing KetoFeed in your morning cold brew coffee as well. KetoFeed is intended only for healthy adults over the age of 18. Do not use if you are currently pregnant or nursing, could be pregnant, or are attempting to become pregnant. Consult a licensed healthcare practitioner before using this product. Discontinue use and contact a doctor immediately if you experience an irregular or rapid heart beat, chest pain, shortness of breath, dizziness, lightheadedness, fainting or presyncope, tremors, headache, nausea, or other similar symptoms. If you are a performance athlete, please check with your sanctioning body prior to use to ensure compliance. Weight Loss, Brain Health, Blood Sugar Regulation & Increased Energy! Low Glycemic Meal Replacement! Designed for the very low carb lifestyle, KetoFeed delivers cold-processed, isolated whey protein with fast-burning, medium chain triglycerides (MCT) to deliver an energetic and appetite-satisfying meal replacement or snack. Typical protein supplements deliver a concentrated amount of fast-absorbing whey protein, rich in BCAA’s, which in turn spikes insulin levels just like simple sugar. Not only does this leave you tired and hypoglycemic, managing blood sugar is a primary key to optimizing fat loss and a key tenet for life extension as well. 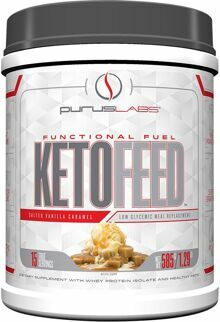 Replace your shake with KetoFeed and literally see and feel the difference. Use it in your morning coffee as the “smarter” creamer, blend it in a number of iced frapucinno combinations, whip it into pudding, or even bake with it. However you decide to incorporate KetoFeed into your daily nutritional habits, we’re confident you’ll embrace the benefits our Founder, Brandon Smith, has been enjoying for years now.